The HP LaserJet CP2025dn is a sub-$500 compact color laser printer that prints double-sided documents and connects via USB 2.0 or over a network with its built-in 10/100 Ethernet. The CP2025dn was easy to set up, though it weighs nearly 53 pounds—you may need some help lifting it. The four small printer cartridges come preinstalled. You simply remove some protective tape from each cartridge before plugging in the printer. The CP2025dn is Bonjour capable and showed up automatically in our Print & Fax preference pane when connected to the network. The unit has a respectable 250-page input tray with an additional 50-sheet tray that holds a variety of media types. In our tests, we found the 600 dpi HP CP2025dn to be both speedy and capable of high-quality prints. It printed our one-page Word test in 17 seconds, which is about average. On our ten-page Word document, the CP2025dn was a bit slower than many of our recently tested color laser printers, with a speed of 44 seconds. It performed better on our four-page PDF test, besting all but one of those printers. The CP2025dn’s Photoshop test time was the fastest we’ve seen for this class of printer. Fast print times are welcome, but only if the printed output is of good quality. This HP printer had no problems achieving glowing ratings from our panel of editors, who deemed its quality Very Good for both our standard Photoshop picnic image and our graphics and fine lines document, while its text quality earned a Superior rating. In today’s economy, everyone is looking for ways to trim costs—so it’s important to look at the total cost of ownership, not just the initial purchase price of a printer. 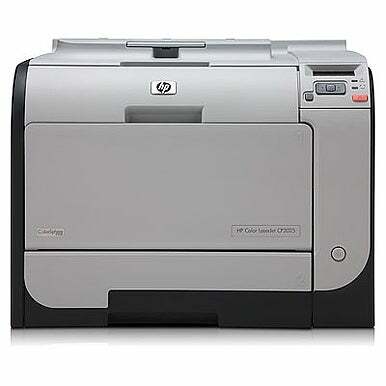 Replacing the cartridges on the HP CP2025dn costs at least $486 (when you buy one replacement cartridge for each color), very nearly the price of the printer itself. HP will sell you a bundle of two 3,500-page-yield black toner cartridges for $175 giving it a cost per black printed page of 2.5 cents. Buying just one black cartridge for $123 raises the price per printed black page to 3.5 cents. Each of the color cartridges (cyan, magenta, and yellow) costs $121 for a 2,800-page yield, giving the printer a cost per color, per page, of 4.3 cents. Thus, a page with 5 percent coverage of each color would cost you 15.4 cents per page to print. That’s not the highest consumable cost we’ve seen, but it’s pretty steep. If you’re looking for a reasonably priced, compact color laser printer that prints high-quality documents at a fast clip, then the HP CP2025dn deserves to be on your short list. If you plan on printing a high volume of color documents, though, you’ll need to budget for its steep price per page.